Free ebooks is a relief for those who love reading and hate spending hundreds of dollars on paper books or carrying bulky folios. Icecream Ebook Reader is powerful and user friendly application that not only helps you open ebook files (which come in specific formats and can’t be viewed without special software) but also let you manage your digital library and get a better user experience while reading ebooks on your PC. Check this article to get a better idea of how to download free ebooks and handle the reading process in a smart way. The first step to take is downloading the application from this website. Simply save the installation file on your computer and run it to start the actual installation. The Wizard will help you complete the process in mere seconds, and once it’s installed, you can open the program and start working. There are lots of websites that offer free ebooks in different formats. Just type “download free ebooks” in your search engine’s box and choose one that you like. Project Gutenberg is on of reliable websites where you can download free ebooks without being worried about your computer's safety. 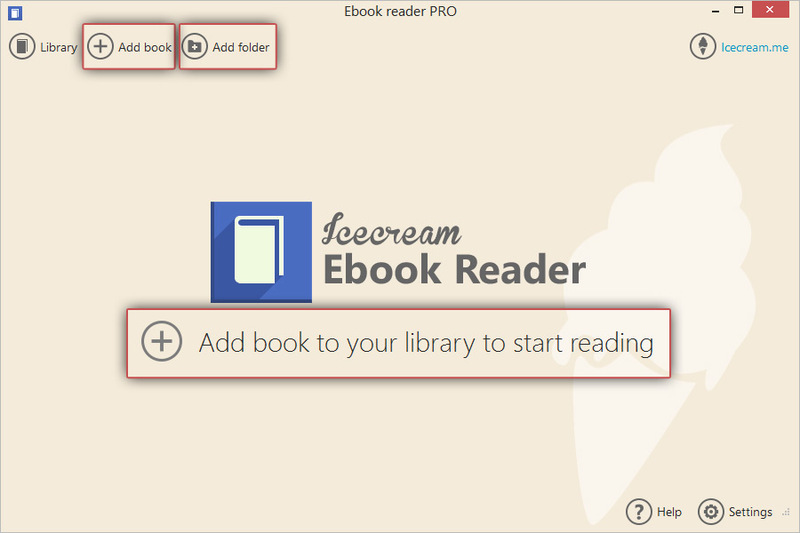 Note that Icecream Ebook Reader only supports EPUB, FB2, MOBI, CBZ, CBR, and PDF formats, so you’d better look for resources that offer books with these extensions. Download the desired books as suggested by a chosen site’s rules and save them on your computer. Now, open Icecream Ebook Reader and add your books as described below. Click the “Add book to your library to start reading” button (it’s located in the center of the main window) or "Add book" button in the upper left corner. Use Windows Explorer to find your free ebooks. 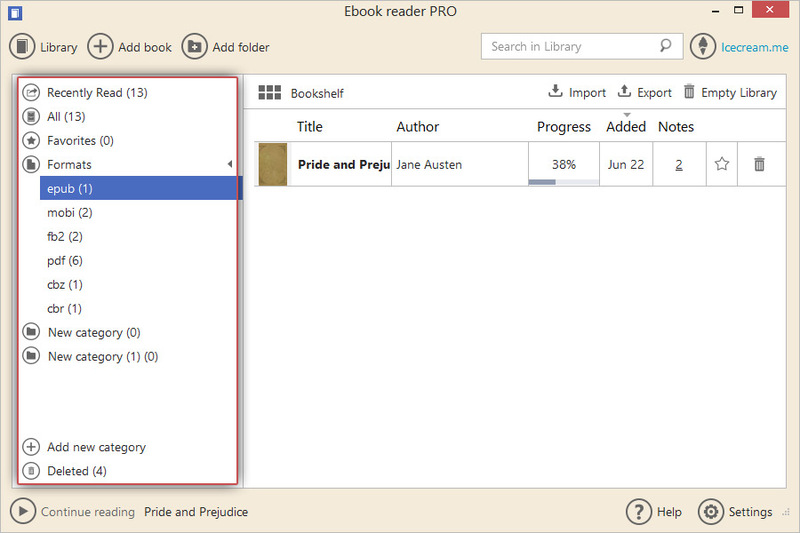 If you press the “Add folder” button in the upper right side of the program you will be able to add ebooks to the program's Library by folders. You can also drag and drop the needed ebook files into the program's Library: drag and drop mechanism is supported. All the added books are securely stored in the Library panel – click the “Library” button in the upper left corner to access it. 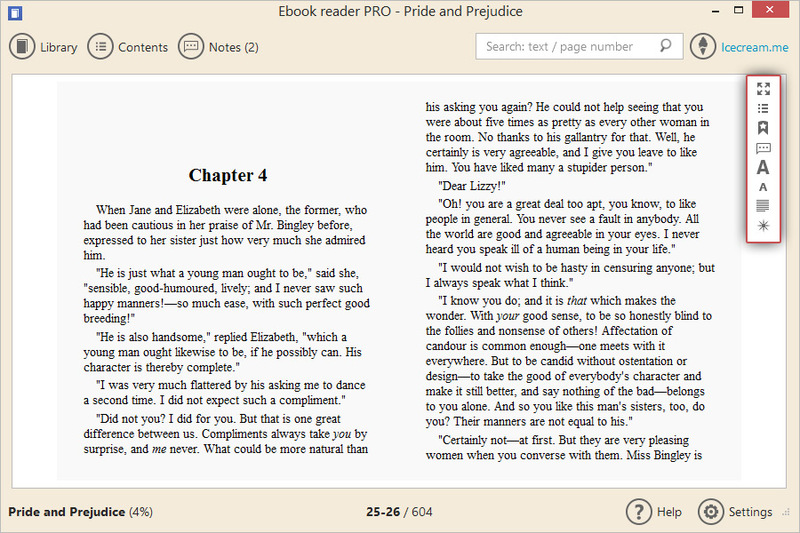 Icecream Ebook Reader features two view modes: Table view and Bookshelf. You can choose one that you like by clicking the corresponding icon in the upper left hand side of the working area. Table view mode shows certain book information like title, author, progress, date of addition to the Library and number of the notes that were added to the book while Book shelf mode displays large thumbnails of book covers. Deleted – If you click the recycle bin icon or select “Delete” option from the book's context menu, the relevant book is being moved to this section. You can restore the deleted books to the Library or permanently delete them. The “Settings” button is to be found in the bottom right corner of the main window – click it to open the Settings panel. There are two tabs of the Settings panel – System (where the settings regarding the program are located) and Profiles (you can find the needed settings for the customization of the books' reading mode here). You can find more information about the settings of this ebook reader here: How to Change Icecream Ebook Reader Settings. Now, when you’ve downloaded free ebooks, added them to the program and configured the settings, you can open and read them on your PC. Just double click a book’s thumbnail regardless of the view mode you are using and click the right/left sides of the window, “Left”/“Right” direction keys on the keyboard, or“Backspace” and “Space” keys to turn the pages, or simply scroll down to read more. Use these controls to make your reading experience more comfortable. In the bottom of the book there's a navigation scrollbar (if it's enabled in System tab of the Settings panel of the program). You can use it to easily navigate through the book's pages.